If you want a great-looking car that expresses your personality without forcing you to take out a second mortgage on the declining value of your home, you have to like the Camaro. In SS form its performance-per-dollar ratio is outstanding as well. The Chevy Camaro is a great vehicle in my honest opinion. I have had it for over 3 years now, and I have not had a single problem with it yet. 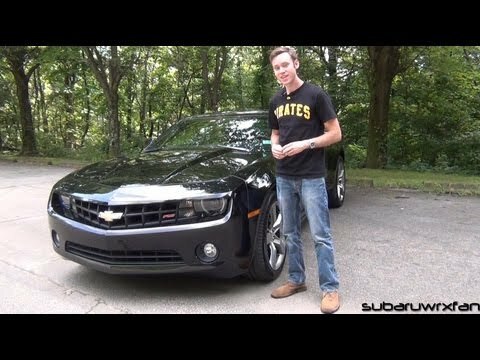 I realized I care more about comfort than performance, so I do not think I would buy another Camaro, or sports car, simply due to its size. The front row is somewhat comfortable, but it sits very low to the ground, so it makes it somewhat difficult to see the road under the driver. The back seats have hardly any room, so if you are going out with others, it will be uncomfortable. I am 6'2, and whenever I sit in the back seat of my Camaro, I have to duck my head to the side because the roof is so low. Performance wise, the vehicle is great. Runs smooth, has plenty pick up, and as long as you keep up the maintenance, it will run for many years. I love the way my Camaro drives!! Camaro is marvelous! No problems as of yet; very reliable and dependable. Comfortable seating in driver and front passenger seats. Comfort in the backseat is a drawback, since the foot room is limited. This car wouldn't be ideal for a family of more than 3. It's fun to drive and easy to maneuver. Love the turn by turn navigation in driver console, would like a more up to date streaming option. When Bluetooth is hooked up I'd like to connect more than just calls. Ideally I'd like to be able to stream Pandora and other apps. I am sure this could be done if I upgraded my center radio console, but wonder why this does not come standard in our day and age. Either way this is not a deal breaker, I love my Camaro! Honest review from a car guy. Comfort is good for a small vehicle though if you are tall do not plan on people sitting in the back seat. The aesthetic is very appealing and color options are great. Only problem I have with the car is 1. The afm/dod components are a flawed design I can understand why they fail, GMC could have done a better job. 2. Like most gm vehicles, which I am use to by now, changing spark plugs on the passenger side is a pain because the little room offered. For the size and tight fit of the entire car it is hard to believe it weighs so much.